123Net’s Fixed Wireless technology provides carrier-grade Ethernet connectivity delivered by microwave technology. Fixed Wireless is an excellent solution for high-capacity applications supporting voice, Multi Protocol Label Switching (MPLS) and Dedicated Internet Access (DIA) services. Fixed Wireless has 100% access diversity from traditional local exchange carrier (LEC) routes and offers a high-speed access alternative for businesses that require a quick installation. Fixed Wireless available for businesses only. 123Net’s Fixed Wireless bypasses fiber and copper by beaming transmissions through microwave radios. Build-out costs and permitting can be avoided using Fixed Wireless. Installation can typically be ready in 7-14 days for 30 Mbps or less, or within 30 days for speeds greater than 50 Mbps. 123Net’s Network Diversity solutions support a broad range of products. Protecting critical voice and data traffic for your unique requirements is designed individually by a 123Net engineer. Add network diversity to support important voice and data services. 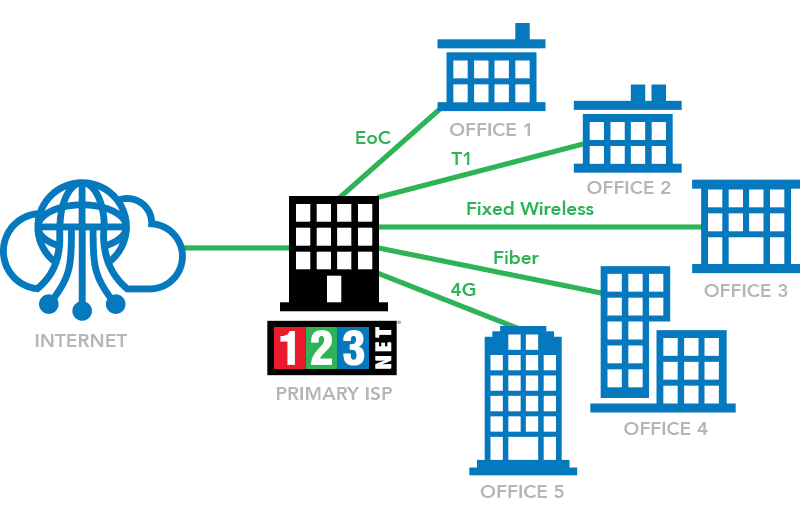 Network diversity designs can include diverse and single route fiber, a fixed wireless connection or a cost-effective option such as Ethernet over Copper (EoC). Specifically designed from a single antenna to multiple buildings delivering high-speed data quickly and easily without any construction constraints. Provide a point to point connection where 123Net has no presence. Provides a rapidly deployed, high-speed internet access that is ideal for conferences (e.g. TEDx), trade shows, concerts (e.g. Jazz Fest and Electronic Music Festival), and more. Fixed wireless provides construction sites with a high-speed temporary internet connection, usually for the duration of the construction project. *Subject to availability. Installation time and speed availability may vary by address. Other conditions may apply. Subject to the terms and conditions of your written 123Net Service Agreement. 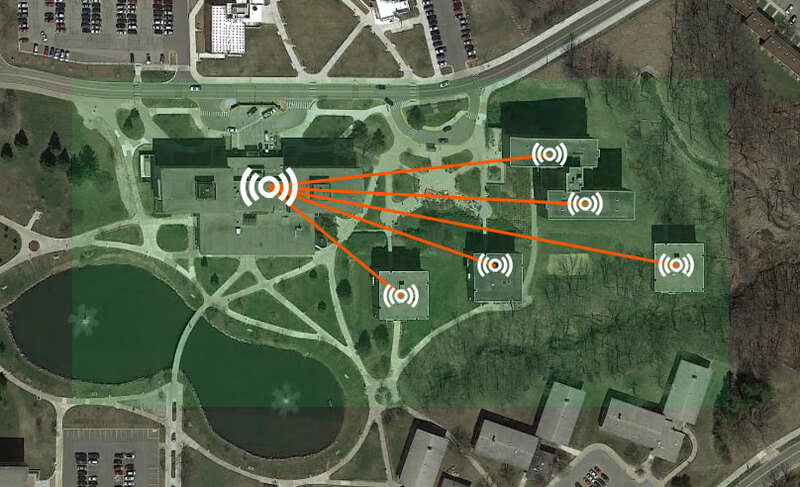 Campus Wireless provides multiple connections for a single user in a Campus environment. Specifically designed to allow a customer to deliver high bandwidth quickly and easily without any construction constraints. The proximity from single antenna to multiple buildings allow high density data traffic to also scale to additional structures when needed. Premier Event Wireless provides the customer with a temporary, rapidly deployed, high capacity Dedicated Internet Access service ideal for conferences, trade shows, concerts, special events, temporary offices, and more. 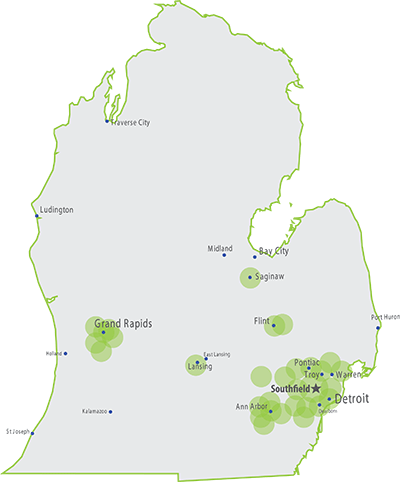 123Net is one of the few Michigan-based provider of Fixed Wireless that offers a short-term solution that is scalable, easily deployed, reliable and proven. 123Net has the capability to support technology needs for large conference and entertainment venues as evidenced by work on behalf of TEDx, Jazz Fest and Electronic Music Festival, and many other events where complex technical requirements were needed. 123Net Temporary Premier Event Wireless Solution set-up on the roof of the Fox Theatre for TEDx Detroit. Construction Site Wireless provides builders with high capacity bandwidth for a temporary internet connection, usually for the duration of the construction project when there are no wired connections available. When large data transfers are required with low-latency, having a reliable connection is critical, as well as the flexibility to deliver the information anywhere at the construction site. 123Net Construction Site Fixed Wireless provides scalable options and reliability that cell services can’t. 123Net Temporary Construction Fixed Wireless Internet on site at the Little Caesars Arena (radio antenna atop construction trailer to the right).